Using new camera - still getting the hang of it, overcompensated in white balance. That is really nice I take my hat off to you as 1/700 scale is very small. 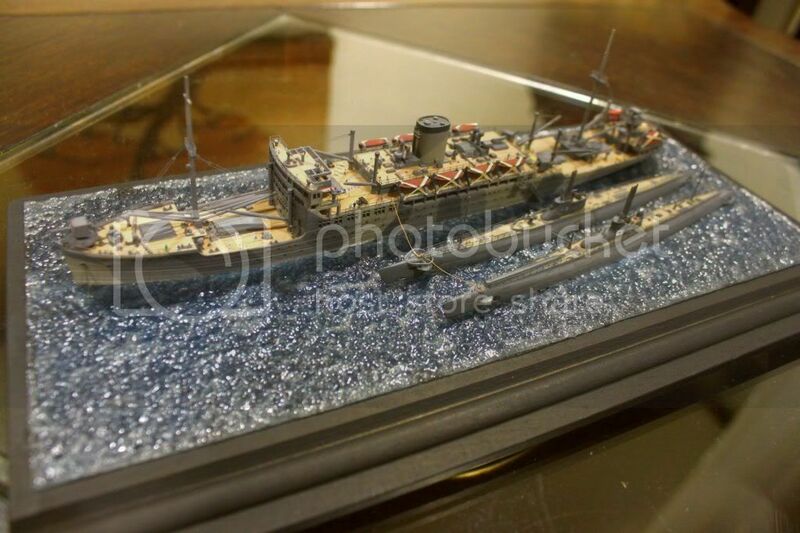 I bought the bigger scale1/350 Hikawa Maru which is the sister ship of the Heinan Maru,I also got all the bells and whistles for it,two sets of photo etch and the wooden decks.Plus Hasegawa are making a 1/350 of Heinan Maru as you have done it in the submarine tender,I think they are going to offer the Hikawa Maru kit in a hospital version. Would be quite interested in the 1/350 version however there's more available resource for making 1/700 dioramas. 1/350 will involve massive amounts of scratch building. Thats pretty nice, how do you guys do those tiny wires for the rigging? Is that stretched sprue or wire or what? no rigging done on this ship yet. those lones you seeing are from pe pullys. for actual rigging i use stretched sprue for lines that needs a bit of sag and fly tying lines if i can't be bothered with sprue. Man how small are those subs? ?